During a short ceremony on Friday January 14, the four lucky winners received their prizes from Elsa Lionel, Marketing and Corporate Communications Assistant for Consolidated Foods Limited. The winners were Lisa Browne, a resident of Carriere and a self-employed businesswoman, who won EC$10,000, while Margaret Spence, a nurse, won a EC$5,000 fixed deposit from Bank of St Vincent and the Grenadines. The other two winners were Abel Soto, restaurant owner, who won himself a Flat Screen television, compliments Courts St Vincent Ltd and Shafia London, Regional Commercial Manager at St Vincent Brewery Ltd., who won herself two Blackberry Smartphones, compliments LIME. 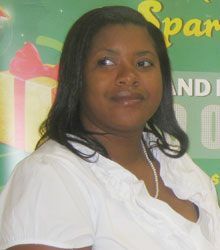 The Save A Lot âChristmas Cheer to Spearâ promotion was held during the months of November and December 2011 and during that period customers were given the opportunity to enter to win the grand prize. For every $100 spent, customers received a coupon which allowed them entry into the promotion. âWe are very excited about the promotions and customers can expect more spectacular promotions for 2012,â Lionel said.